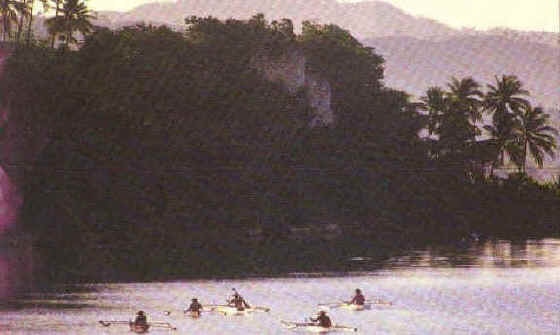 Dawn bathes Loboc River in early morning light as fishermen set out in their outrigger canoes. As the day wears on, its banks will echo with the chatter of women doing their laundry, and the laughter of children taking their daily bath. Tourists can take a cruise up-stream and enjoy the fresh breeze coming from the coconut trees and other plants that line the riverbank. A mini water falls could be seen at the end of the river. Down-stream cruise would take you to a local scenic ride. You could also partake of a sumptuous lunch in a floating restaurant which needed reservation for preparation.